One of the biggest hurdles in drug discovery is in translating hardwon biological discoveries into innovative new chemical leads. Once a new target has been validated, it is easy enough to test a small screening library of perhaps 500 compounds for activity against that target. This may generate a series of hits, but these are unlikely to be novel enough to form the basis of a lead series. Moving from these initial hits to a novel chemistry that can be patented and developed for a chosen indication is a real challenge, particularly in smaller companies with limited chemistry resources. Outsourcing companies have sought to fill this gap in different ways. Traditional outsourcing companies will synthesize and test a series of compounds that are specified by a client. This, of course, requires the client to have some idea of a likely set of innovative chemical starting points. More recently, the best outsourcers will have designed specific libraries that may contain novel compounds active at the target class. This is a good solution in many cases but involves the use of third-party intellectual property. A big question now is whether biotech companies can begin to identify novel chemical starting points without requiring huge investments in an internal medicinal chemistry program. A medicinal chemist would approach this challenge by seeking to understand how the different parts of a ligand’s structure affect its activity at a target. This analysis of structureactivity relationships (SARs) is fundamental to understanding which properties of a molecule are essential for its activity, and hence being able to design novel molecules that have different structures but the same critical properties and predicted activity. FieldView, a new tool from Cresset BMD, which is available for free, enables this type of SAR analysis. FieldView provides an intuitive way to gain insights into the required molecular properties and enables new molecules to be easily designed and their likely activity accurately evaluated. To do this accurately from a biological perspective, FieldView uses molecular fields (Figure 1) rather than comparisons of 2-D structure. We know from years of drug discovery experience that a compound’s biological activity cannot be predicted solely by its 2-D chemical structure. Biologists instinctively recognize that activity is instead determined by the interactions of the complementary molecular fields (surfaces) of the target protein with those of the ligand in their respective binding conformations. The interactions between these fields drive whether a ligand can make a good fit with the target’s active site. Field-based tools calculate and compare the field patterns of compounds to predict the similarity between their properties and activities. The most important regions of the fields (the extrema, where molecular interactions are likely to be strongest) are summarized by a field point pattern as shown by the colored spheres in Figure 1. Since the target protein’s active site conformation and (by extension) its fields have been highly constrained by evolution, any compound that is capable of presenting a complementary set of field points (in a 3-D conformation that is accessible under physiological conditions) is very likely to have the same biological activity and properties as the natural ligand. This pattern of field points, therefore, becomes a template for the specific biological activity. 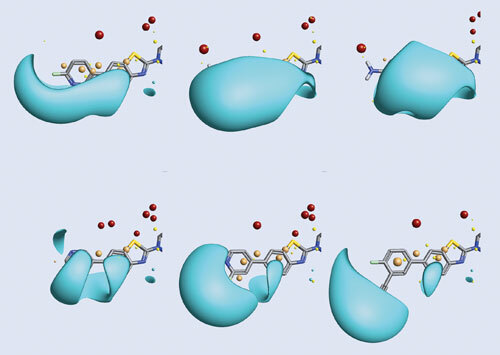 As fields can be computed from the structures of active ligands alone, they can be used to identify diverse potential new lead structures even when the x-ray crystal structure of the target protein is not known. 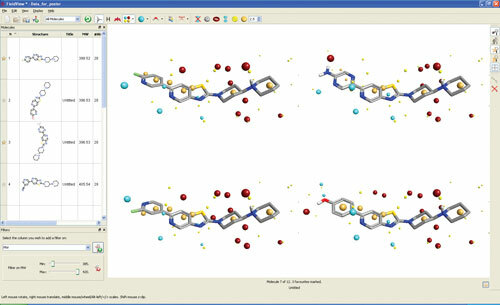 In the study shown in Figure 1, FieldView was used to analyze a series of H3 antagonists with a view to understanding how to discover novel active molecules. Histamine plays a variety of physiological roles in the CNS and peripheral tissues through the four known G protein-coupled receptors, H1, H2, H3, and H4. Histamine H3 receptor antagonist-enhanced neurotransmitter release offers a promising approach to the treatment of several CNS disorders. In this study, rather than starting with hits from a screening library, data on several H3 antagonists was extracted from ChEMBL and analyzed with FieldView. Each member of the chemical series was drawn in FieldView’s molecular editor and its molecular fields added. The field point patterns shown in Figure 2 were then studied and compared to delineate the combination of properties required for optimal biological activity. Parts of the field patterns that are conserved among highly active structures but different in less active compounds are particularly good indicators of critical regions of the molecules. Higher activity can be seen to be associated with negative (blue) Field patterns in the lower left of the presented molecule views, and was probably due to specific hydrogen bonding interactions. However, the most active compounds also presented high electron density in both the terminal and central 6,5 aromatic ring systems, as evidenced by larger negative molecular surfaces shown in Figure 3. The findings from this type of analysis have many uses. They can be used directly in FieldView to evaluate the likely relative activity of newly designed or competitor compounds. The structures can be drawn in FieldView rather like chemists currently doodle structures on napkins, and their activity and properties immediately evaluated. They can also be used to direct chemical synthesis into areas of the molecules most likely to deliver the desired changes in activity. In addition, the results can be used with virtual screening tools to identify potential bioisosteres (structurally diverse compounds with the same activity) from large compound collections. In the H3 example given, a field pattern selected from the most active structures was used to counterscreen an existing compound collection to identify potential H3 antagonist structures. A large number of matches were identified, with 68 distinct chemical scaffolds. 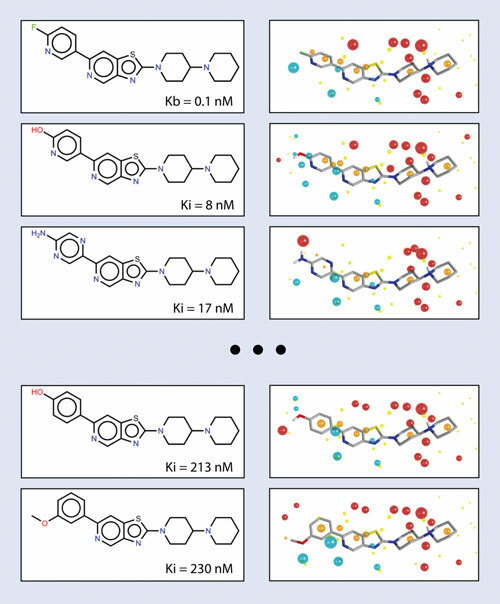 Evaluating the level of innovation embodied in these results, the 2-D similarity score of the most interesting new molecules (measured against the most active), was found to be less than 0.7, which is the de facto cut-off for 2-D-based scoring methods. This means that most of these structures would be very unlikely to appear in a traditional library screening process as there would be no reliable way to predict their activity at that target. Using fields and FieldView to drive SAR analysis then, we can simultaneously be more inclusive of structural diversity and more specific about identifying the features that determine the desired activity. This can help to generate a wide set of novel chemical starting points that are generally more patentable and diverse than traditional initial screening hits. Biotech-based discovery teams can use FieldView to generate ideas and chemical starting points for their projects based on a solid knowledge of the biology of the novel target (whether or not its structure is available). This may help them to add more innovation and value to their chemistry assets and reduce their dependence on outsourced medicinal chemistry teams. Steve Gardner, Ph.D. (steve@cresset-group.com), is a nonexecutive director of Cresset BMD.